Popular culture, self-help books and blogs-a-plenty will all tell you that in order to reach your goals you need to “have a plan and work your plan.” Yet for so many of us that is just not enough. Ever feel like you know what you need to do but just can’t get yourself to do it? You are not alone! We use coaching skills, professionally well-honed insights and a unique visual approach to spur focused action. Our purpose is to serve as catalysts so our clients can attain the change they yearn for. Know you can do better but not sure how to move from thinking to doing. Want to extinguish the internal contrarians which undermine your enthusiasm and exaggerate the obstacles in your way. Are certain that wearing too many hats is preventing your progress. 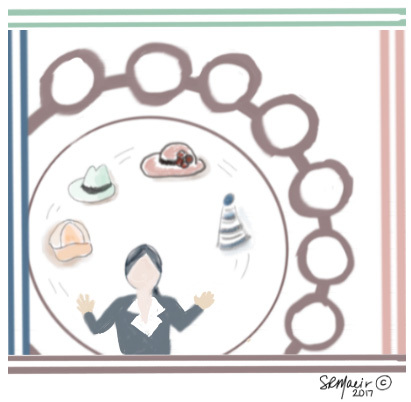 Wondering which role (hat) will get you where you strategically want to be. Find clarity, know which hat to focus on and get where you want to be.